Oil Resistant Non-Conductive Nitrile Hose is a premium grade multi-purpose hose that is electrically non-conductive. Often used in air, water, and oil transfer applications. This hose meets ARPM Class-A High Oil Resistance requirements. 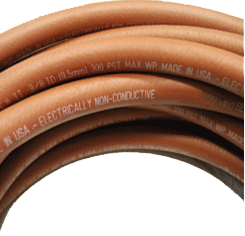 Rated at 300 PSI through 1″ ID, 200 PSI for larger sizes. Electrical resistance is limited to 1 megaohm per inch at 1000 volts DC. 1503 series hose is available on bulk reels or assembled to your specifications (most sizes). This oil resistant hose makes an excellent highly durable air hose for shop environments where hoses are exposed to oil and small oil spills that tend to swell and degrade shop hoses rapidly. WARNING: This product contains 1,3-Butadiene, a chemical known to the State of California to cause cancer, birth defects or other reproductive harm. Do not use in connection with drinking water. Wash hands after handling. Visit www.P65warnings.ca.gov for additional information.